Improve your Search Engine ranking ! Imagine more sales because your site comes up in searches more often than before. How is this done? With a simple, easy and efficient way to optimise your website. Drag 'n' drop web driven interface. With it's unique drag and drop design interface, you'll be creating your website with ease and you can be instantly online in minutes. This SEO WYSIWYG (What You See Is What You Get) Solution is ideal for business and people that want a quick, simple and efficient way to create and maintain their website. Dedicated servers such as the SEO WYSIWYG VPS can help you Optimise your site for Search Engines. WYSIWYG (pronounced /ˈwɪziwɪɡ/) is an acronym for "What You See Is What You Get"
SEO (pronounced /es'ee'O/) is an acronym for "Search Engine Optimisation"
VPS (pronounced /vee'pee'es/) is an acronym for "Virtual Public Server"
Creating a website is easy with our SEO-1 hosting package. Once the package is setup, you will have a "clean looking" base website which to work on. By logging into the Web Editor as admin you can then start editing the site and making it your own. Editing the pages is simple and quick. Once you click on the "Save and Close" button your edits are updated live. There is no need to spend on costly web designers who would charge a fortune. There are video tutorials to help you get started. When you're in editing mode of a page. To edit the section you want, all you have to do is click on the Widget tab to open up the editing window. Once you're finished editing just click the "Save and close" button. How can the SEO-1 Hosting Package help with attaining better results in search engines? When the search engines crawl through your website, what they do is scan the pages for keywords. If you have not entered any keywords in the properties of the page, then the search engine will take it from your page's content. Just say that you want to target a particular keyword or phrase. Just open up the page's property window by clicking on "Edit page" button, then enter your targeted keywords in the field provided. Hit "Save and close" when you're done. How easy was that? 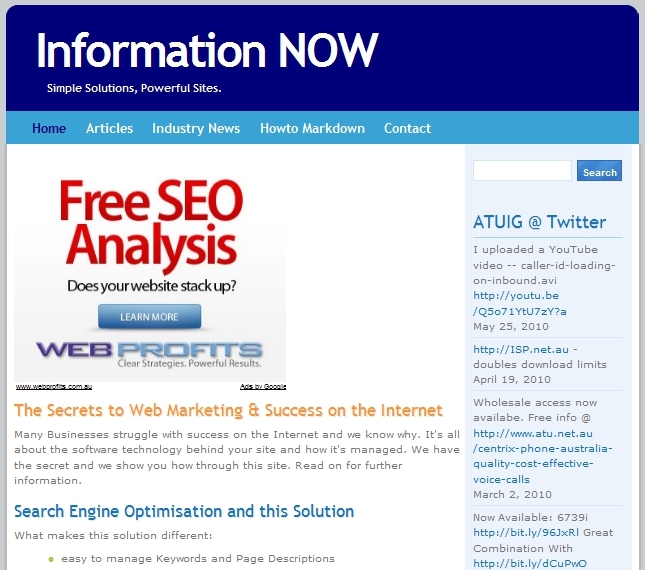 That page is now optimised for search engines. In Admin, if you have it configured, you will be able to see graphs that can show you Visitors, Hits and Browsers stats. This means that while you're working on a page, you can have someone else work on another. This speeds up your website development. Keep all your media, images and documents in one simple to access area. If you need to use them just drag it from the Media pane to the Editor window. And if you're a coder, there are tools for you to utilise to write your own Widgets or rearrange the default layouts. You can create multiple users. So you can keep track with who edited the page. A friendly customer service representative is always happy to give you a hand. If you've hit a wall, please feel free to ring our technical support team on 02 8332 3030 or filling out the contacts form. You can have a professional looking website for under $10 per month. That's not even $120 per year! With it's easy to navigate drag and drop interface, making the website will not only be quick and easy, but will also be fun! With it's unique WYSIWYG web design capabilities, developing a complex website is made very simple. The interface is a visual html editor where all you see is the text, widgets and images in your chosen sections or zones. Click on the "Buy Now" button above which will redirect you to the ordering pages. Complete the order and then you've just finished the provisioning of your new SEO WYSIWYG Web Editor. To access your homepage just type in the domain name in your favourite browser. To enter into admin mode just add a "/admin_dev.php" without the quotes at the end of your URL.